TR300 Bench-top robotic micro-soldering platform. 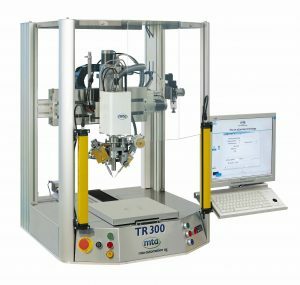 The TR300 is the latest Cartesian precision bench top robot from MTA. This competitively priced robot provides an easy step into the automation of soldering. Using a built in industrial PC running WINDOWS ensures ease of use. The programming is menu driven and no special familiarity with computers is required to successfully program the robot. Each of the 4 axis is individually programmable as well as all the parameters for soldering, computer data import or directly at the touch screen. The compact bench top area (only 700 * 720mm) provides a very generous working area (300 * 300mm). The robot can be supplied fully fixtured and programmed as a turnkey solution. Fully Programmable via front panel touch screen or PC. 300 * 300 mm working area. Industrial PC controller running Windows.